We saw this documentary in a theater tonight. It’s was excellent and well worth seeing. Very much so – as history it was a problem – as cinema it was just gorgeous…..
How so? 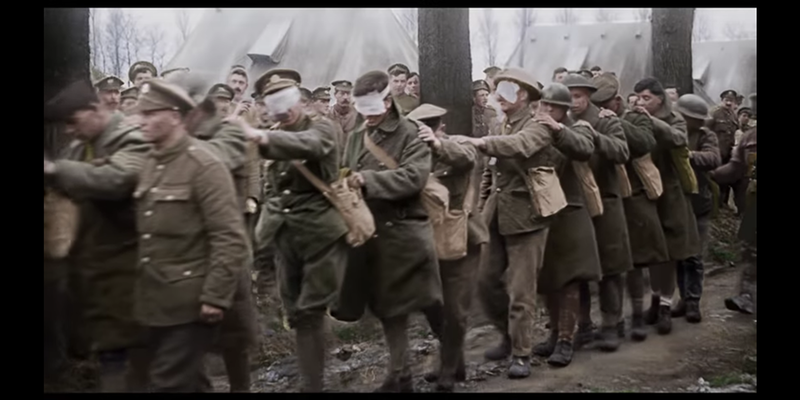 It was put together from 100 hrs of WWI footage from the Imperial War Museum. Peter Jackson did a 30-minute narration after the final credits where he showed the audience how it was made. I didn’t see anything that appeared to me to be an obvious error. WWI history isn’t my strong suit though so I could be wrong. I’ve been teaching a course on WWI at OU for several years and have invested a good deal of time reading the newest research… suffice it to say that there are a great number of problems with the underlying historical sense of the film…. (footage is only as good as the vision animating its editing). Again – I actually enjoyed it a great deal – but it is a very limited and problematic insight into a remarkably complicated war…. What would you have done differently? Or what would you have advised Jackson to do differently? One example – it sounds fairly likely that most of the commentary about the German soldiers being done in/disgusted, etc. came from the summer of 1918 – true enough that…. but that ignores how they came within a hair of, if not winning the war, then seriously prolonging it via a seizure of Paris or knocking the British out (the towns to know here are Amiens and Hazebrouck) …. i.e. yes, by August-November of 1918 the Germans were the pitiful boys and hungry men you see – but it took a long time to get there (and there was a profound popular hatred for England in Germany during the war). One thing I adored about the film – look at the teeth of the British soldiers! There are many other issues – again, the film as film was wonderful – and as a kind of snapshot of 20th century reflections on “what it all meant” it was authentic – BUT as a vision of what people felt AT THE TIME (and this is one of the key problems of oral history) oral history can lead you astray (esp. given that the men here interviewed were speaking almost 50 years after the fact). Thanks. I viewed it with the assumption that it presented a snapshot of experiences and really nothing more than that. The bad teeth were classic – and expected given my own background as one who emigrated from there. The lip-reading aspect of the production was fascinating. I figured the dialogue was made-up until u heard the explanation afterwards regarding how the movie was put together. I don’t want to talk down the movie at all – it was wonderful as a small slice of a remarkable period (and there were so many things listening to it that gave you a sense of how writers like Tolkien and C.S. Lewis were formed and molded by the war)…. I just regret that so few in the US understand so little about this conflict.